Sign of the Arrow was established in 1966 when nine women of the St. Louis Alumnae Club of Pi Beta Phi took a leap of faith to expand their fundraising efforts from the annual Carrousel at Tilles Park to a year-round shop. 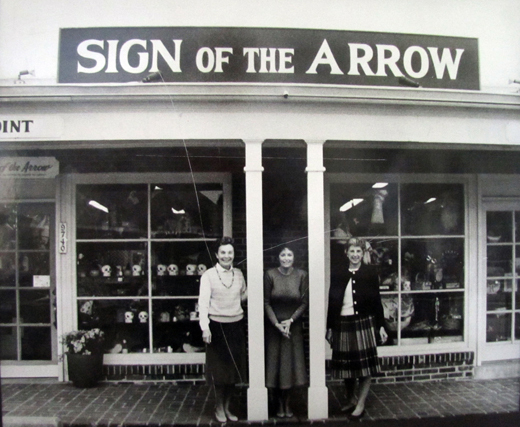 On August 1st, 1966, the 1867 Foundation was established and the first storefront for Sign of the Arrow opened at 9666 Clayton Road. The original merchandise selection consisted of cards and paper products, baked goods, consignment needlepoint and crafts. The shop grew and, in 1975, moved one block west to 9740 Clayton Road. As needlepoint interest increased in popularity, Sign of the Arrow became known for its needlepoint kits, canvases and custom belts. Over the years, the focus on needlepoint continued to be strong and the shop diversified the gift selection. Through a loyal customer base and exciting innovations in needlepoint, Sign of the Arrow outgrew its home once again. In 2014 the shop moved to its current location at 9814 Clayton Road. With the added space, Sign of the Arrow expanded both its needlepoint and gift departments and created an area for specialized classes and instruction. From the beginning, Sign of the Arrow was founded as a not-for-profit to support the St. Louis Community. As business thrived, the shop was able to donate to a greater number of charitable agencies and the need for a Philanthropy Committee arose. The committee reviews grant applications and makes the difficult decision of choosing grantees. Today, the shop is staffed by 80+ community volunteers who give in excess of 22,000 hours annually to help run Sign of the Arrow. ALL shop proceeds benefit local area agencies. Sign of the Arrow has donated more than $3.6 million dollars to 187 different charities since inception. Sign of the Arrow continues to be known for its extensive selection of designer needlepoint, including hand-painted canvases, custom designs, custom finishing, furniture, fibers, trunk shows, and classes. Knowledgeable staff and volunteers assist both novice and experienced needlepointers. The shop also offers unique gifts, including decorative accessories, holiday decor, sorority and baby items, picture frames, stationery, serveware, and more. For 50 years, our customers have truly impacted the community when they shop at Sign of the Arrow. As we look toward the future, we hope to increase our giving while remaining the area’s premier needlepoint and gift shop. Click here to see grant recipients from the past 50 years! Click here to see a video of our history! Join us for our 50th Anniversary Open House at Sign of the Arrow on Wednesday, September 7th, beginning at 11:00 a.m. We'll celebrate with special in-store promotions, discounts, drawings and refreshments! I am a long-time customer of Sign of the Arrow. One thing that stands out in my mind is how nice and efficient the people are at your shop, especially Randi. One piece sent for finishing contained a small portion of a canvas not yet completed. Randi, bless her heart, finished it for me. I thought her offer to do this was extraordinarily generous. Over the years I have done more belts than I can count. For the last ten years, Sign of the Arrow has been finishing these belts. What great craftsmanship! Below is a link to the book I wrote, Dancing with Stitches. You will notice that many of the items in the book were finished by Sign of the Arrow, including Christmas ornaments, half dolls, purses, a Nordic Christmas House, Standing Santa, Christmas wizard, etc.